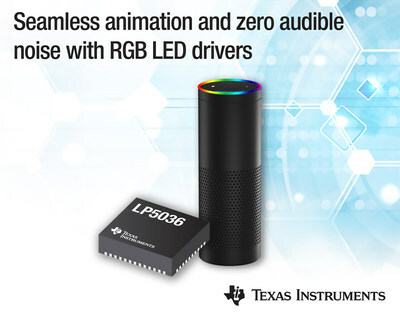 DALLAS, Nov. 28, 2018 /PRNewswire/ -- Texas Instruments (TI) (NASDAQ: TXN) today introduced a new family of LED drivers with integrated, independent color mixing, brightness control and a power-saving mode. The LP5018, LP5024, LP5030 and LP5036 enable smooth, vivid color and reduce system power consumption. For more information, see www.ti.com/lp5018-pr, www.ti.com/lp5024-pr, www.ti.com/lp5030-pr and www.ti.com/lp5036-pr. See how to implement sophisticated lighting patterns for end equipments with a constant voltage supply using the "Various LED Ring Lighting Patterns" reference design. The design utilizes two LP5024 LED drivers to dynamically adjust brightness without impacting contrast ratios in ambient lighting situations. Read the blog post, "Using an RGBW LED driver to elevate LED human machine interface designs." Watch the video, "LP50X LED drivers: achieve optimal color and brightness with zero audible noise."